Office interior costs can vary hugely depending upon how you want your office to look and feel, the density of the office and the design. 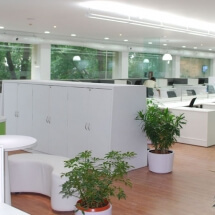 Costs of interior fit-outs in Mumbai can vary anywhere between Rs. 2500 per SFT to Rs. 3500 per SFT on an average. These costs include all items like civil work, carpentry, modular furniture, electrical, networking, lighting, fire fighting, etc. The interior designer’s fees may be charged over the above costs. Considering that the office fit-out is used for an average time of 5 years, the cost per SFT per month works out to about Rs. 42. Add depreciation benefits and residual value to the mix and the overall cost comes down by a considerable percentage. Hence offices prefer moving to a new, affordable and bigger office spaces without worrying about the interior fit-out costs. This is peculiar in cities like Mumbai, Pune, Bangalore, Hyderabad, Delhi etc. where rental costs are much higher than the average interior fit-out costs. It makes commercial sense for companies to keep moving to new spaces either to negotiate better rentals or to move into a bigger space. It is anyway advisable to revamp the office interior setup every 5-6 years due to change in technology with respect to faster networking, energy efficient HVAC systems, energy efficient lighting etc. The savings that these new systems bring in will offset the cost of the fit-outs by a certain percentage. Additionally from human resource point of view a new office setup brings in a certain level of freshness. 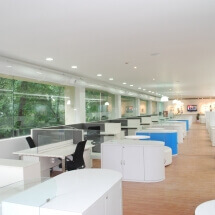 Even minor HR related modifications in the office design can be done like adding cabins, cubicles, meeting rooms etc. 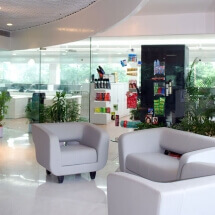 This entry was posted in Architect's Pick and tagged india, interior design, mumbai, office interior, office interior cost. Bookmark the permalink.